Desk Lamp designed by Bernard Maets. Mr. Maets specialized in a wide variety of weapons and tools using steam as the primary energy source. Bernard began building lamps in a variety of styles after a meeting with Thomas Edison. 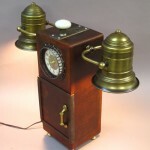 Fully functional lamp with dimmer controlled by the steam valve on the side. Edison bulb gives a warm light.